Data growth and adhering to compliance requirements are fundamental challenges facing organizations. With the increase in regulatory and compliance requirements, data management has expanded beyond the domain of IT and storage administrators and risen to the c-level management team. Policies for data retention, legal hold and data disposition along with extended life cycles have increased the complexity of managing and protecting ever increasing amounts of data. This coupled with the c-suite demanding more flexibility and efficiencies from the IT organization are raising questions regarding the traditional silo approach for managing archive data. What is Secure Archive Manager (SAM)? Secure Archive Manager (SAM) is a software application that enables flexible and compliant data management over the life cycle of the data. SAM enables CCO/CIO to meet compliance requirements for WORM, retention, legal hold, and data disposition. SAM also helps the IT organization deliver a more secure, flexible and efficient approach to long term archiving needs using traditional storage, cloud storage and object storage. Competitive approaches lock the customer into an expensive and proprietary hardware centric infrastructure. The software architecture of SAM makes it easy to protect data today and also move it forward to new technologies in the future. Secure Archive Manager presents the classical CIFS share or NFS export to users and applications. Then SAM effectively unbundles the access to the content from the storage of the content. SAM leverages virtual file systems to accomplish this task. The virtual file systems are not integrated with the host operating system. Hence things like stubs, links, DFS or junction points are not used and thus OS limitations (e.g. file count or size of file system) are not imposed. Users and applications will continue to view the tree/path file system structure they are expecting. However, now the content can be stored where it best suits the needs of the organization. This means that the front end access protocol can be different from the back end storage protocol, with SAM handling the translation. The separation of "access" from "storage" is what enables storage administrators to control the storage location or locations without impacting user access. Content can be moved from one storage location to new more scalable storage system (e.g. local disk to NAS) or to a completely different storage type (e.g. NFS file to S3 object) to lower cost without any updates to client/application access. 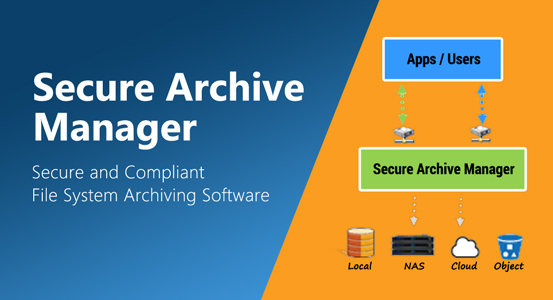 Secure Archive Manager is a software application that manages data and provides long term and compliant archiving functionality with maximum flexibility and security. Archives are created in SAM and shared out to users and applications. SAM opens up the possibilities for IT to create the best archiving environment for their needs. For instance an archive can be created providing a CIFS share to users and then translate the files into objects for storage on Amazon S3. SAM uses the Windows ACLS to control access and also stores them when writing the content to the S3 cloud. This way if SAM has to be recovered from the cloud repository all the time stamps, meta data and permissions will be the same as the original files.